For the second of Salut! Live's selections of 10 records for its desert island exile, I have chosen some political songs that have given me particular pleasure. The idea occurred as I read contributions to a thread at the Mudcat site that began with a request for the guitar chords to Leon Rosselson's outstanding Song of the Old Communist, which naturally wins a place here (as does Oysterband's version of his World Turned Upside Down. There are omissions, mostly to do with my present out-of-a-suitcase life in the Gulf. Robb Johnson, Martin Carthy and others should be in there somewhere, plenty more Rosselson songs deserve to be highlighted and American protest ought to be represented. So it is likely that further lists of political songs will appear in due course. Inclusion of a song does not necessarily mean that I agree with all, most or indeed any of its sentiments. I am able to appreciate lyrics by Left-wing writers even when they are clearly some way to my own Left. However, I am not sure I could be as open-minded if the Right had lots of its own songs. In one of my earliest columns of folk album reviews for the Daily Telegraph, probably 18 years or so ago, I recalled that the actress Susan Penhaligon had once said she was reduced to a state of disbelief by the discovery that the man next door, who played sublime guitar, was a Tory. She could not reconcile the two aspects of his life, and I must confess that it was easy to see what she meant. We already know what Christy Moore would choose, because he was on the programme last year. I thought I would compile my own list, but then realised that I could repeat the exercise over and again. So here is a new feature of Salut! Live, the first of a series of playlists to help me survive in soul as well as body on my desert island. Since I propose further lists, try to imagine I am hopping from one island to another in my attempt to escape and therefore qualify for a new list each time. The body's needs, I trust, would be catered for by my luxury items: limitless supply of champagne, red wine and Guinness, to wash down as much French, Indian and Middle Eastern cuisine as I could eat. Read on for my first list. 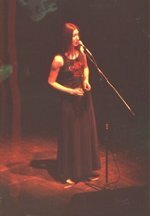 The picture of Maddy Prior, lead singer of Steeleye Span and the band's public face, is used with the kind permission of Roger Liptrot of the Folk Images site. A clever chap at YouTube came up with this delicious slice of Steeleye.